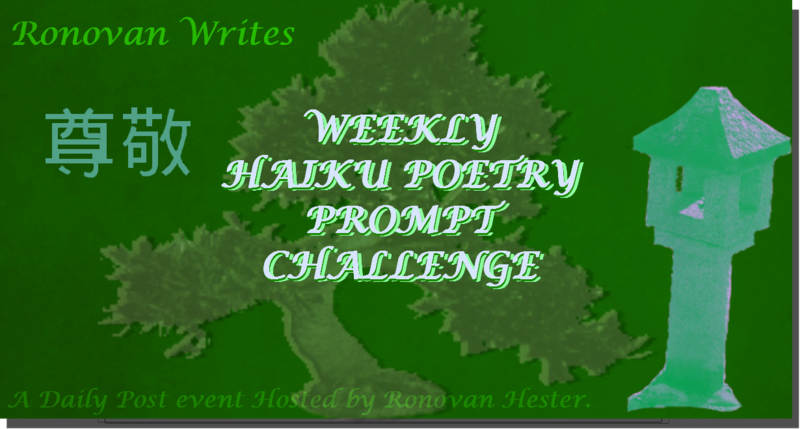 Please use the tag of Ronovan Writes Haiku Challenge with your posts, if you can remember. That way if links/ping backs don’t work I can find you. If you enjoy this challenge, you may want to check out my other Weekly Challenge, Friday Fiction with Ronovan Writes. This week’s challenge has the writer using the first line of one of their favorite songs as the first line of their writing piece. Click HERE to check it out. Click HERE to read the CHAPTER ONE of my debut Historical Adventure novel due out February 14, 2016. Ronovan Hester is an author, with his debut historical adventure novel Amber Wake: Gabriel Falling due out in February 14, 2016. He shares his life through his blog RonovanWrites.WordPress.com. His love of poetry, authors and community through his online world has led to the creation of a site dedicated to book reviews, interviews and author resources known as LitWorldInterviews.com. Thanks for the prompt and the challenge. Wonderful prompt words. Well write after I wake up. Coffee, Martha has small elective surgery today. Prayers please. child, the guardian angle of all life. So here is what I penned. Here’s my response to the prompt, Ron! do hope my link works this time! Sorry Ron, my pingback doesn’t work so here is the link!… save you rooting around! I’m a glutton for punishment. 🙂 As in the time put in. I’ve actually begun putting a schedule in place to try and manage it all with as little pain as possible. 🙂 Just so I don’t let one suffer for the other. That´s what I need to improve, scheduling my time. Probably would be quite more efficient. Here is my Haiku. Have a lovely week! Thank you for challenge this week! Time seems to fly and then I realise I have missed more challenges. Not sure how well this one works, but I like it anyway. Loved this week’s words! http://wp.me/p3eYyj-1aT 😀 Have a great weekend! I included my haiku response in a short story I posted 2/6/16 on Simplicity Lane.